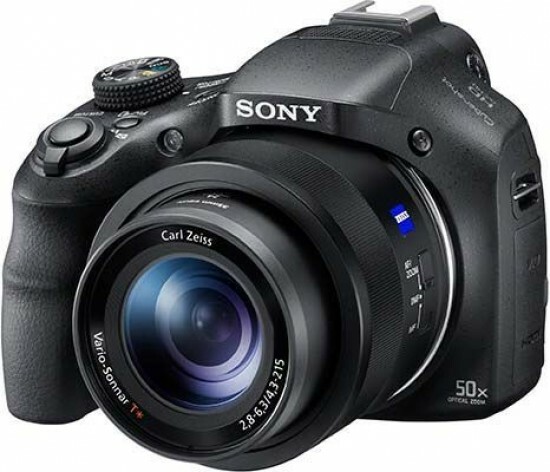 The Sony Cyber-shot DSC-HX400V is a premium super-zoom camera that features a 50x, 24-1200mm zoom lens, 20.4 megapixel back-illuminated Exmor R CMOS sensor, BIONZ X processor, 1920x1080 50p Full HD video recording with stereo sound and HDMI output, multi interface shoe, and Wi-Fi and NFC connectivity and built-in GPS. Other key features of the Sony HX400V include high-speed autofocusing, a tilting 3-inch LCD screen with 921,000-dots, 10fps burst shooting mode at full resolution, ISO range of 100-12,800, enhanced Optical SteadyShot with 3-way Active Mode, Intelligent Auto Plus, Superior Auto, Program and full Manual shooting modes, a range of Picture Effects and and support for both Memory Stick PRO Duo and Secure Digital cards. The Sony Cyber-shot DSC-HX400V is available in black for around £420 / $449.99. Sony's new Cyber-shot DSC-HX400V is virtually identical to the HX300 model that it replaces, so a lot of the comments that we made in our review of that camera apply equally to the new HX400V. 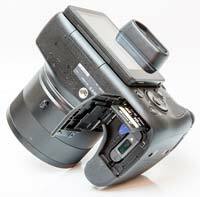 The HX400V clearly takes its design cues from an entry-level DSLR camera. The HX400V's optical zoom is still a massive 50x and the effective resolution remains at 20.4 million pixels from a 1/2.3-inch Sony Exmor R CMOS sensor. Key new features include a 3x faster processor, multi interface shoe, and built-in Wi-Fi, NFC and GPS. The HX400V has a very chunky handgrip that's large enough to squeeze three fingers comfortably around and usefully has indentations for your top two fingers, helping to provide a steadier hold when shooting towards the extreme telephoto end of the zoom. To further help prevent blurred shots in such circumstances and in low light, Sony has also provided optical 'SteadyShot' image stabilization, reducing the shake apparent on the LCD screen and making it easier to frame the shot. The build and finish of the Sony Cyber-shot DSC-HX400V is of a high quality, with the all-black matt finish to the body and various DSLR-like dials and controls - not to mention both angle-adjustable LCD and built-in electronic viewfinder - on initial inspection lending it an impression of being a 'serious' enthusiasts' model. The compact size also means that locating the right control is never a stretch for forefinger or thumb. Most of the features you want to access are literally at your fingertip, which of course makes for speedier overall operation. Overall dimensions are 129.6x93.2x1.03.2mm and the HX400V weighs a starter DSLR-like 633g (body-only), making it both bigger and heavier than most of the super-zoom competition. The front of the Sony Cyber-shot DSC-HX400V is dominated by the Carl Zeiss Vario-Sonnar lens, here boasting a maximum aperture of f/2.8 at the widest-angle setting and a focal range the equivalent of a ultra-wide-angle 24mm to 1200mm in 35mm film terms - suggesting serious 'poke' at the telephoto end and real suitability for those paparazzi style candid portraits at full zoom, as well as of course landscapes and group portraits at the wider end. 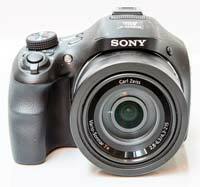 We also get an AF assist/self time lamp porthole top left of the lens when viewing the Sony Cyber-shot DSC-HX400V front on. The barrel itself features a lens ring, which will hold real appeal for photographers who prefer to get hands on, as this not only controls the zoom - if you don't want to use the compact camera-style lever that alternatively encircles the shutter release button - but can also be used to focus if flicking the switch at the side of the lens to 'MF' or new 'DMF' mode. The top plate of the camera extends the HX400V's sophisticated look and feel, with a stereo microphone sitting just behind the otherwise hidden raised flash. Behind the microphone is the new multi-interface shoe, which allows a number of accessories to be fitted, with an external flash, stereo microphone, LED video light and shutter-release remote controller all available. To the right of this, when looking down at the camera as you grip it in both hands, is a small button for swapping between use of the EVF and LCD Monitor. Note that there's now an eye sensor on the HX400V to automatically switch between the two, a big improvement on the HX300 which lacked this very useful feature. The next control along is the narrow lozenge shaped on/off button, with an embedded lamp that glows green when the camera is switched on, or orange if the battery is low and the unit is being recharged. Incidentally we don't get a separate mains charger here. Instead there's a mains lead, adapter and plug, meaning that the lithium ion pack is charged in-camera. When your battery is down, so therefore is the camera, so it's a good idea to invest in at least one spare battery. The Sony Cyber-shot DSC-HX400V takes just over one second to power up, the lens extending a little beyond its protective housing to arrive at maximum 24mm wideangle setting while the image on the rear LCD pops into life. While a little slower than an actual DSLR, that's very respectable for this class of bridge camera. The Sony Cyber-shot DSC-HX400V is commendably swift to determine focus and exposure, with the green AF point/s highlighted on-screen the very instant your finger presses down on the shutter release button and finds the half way point. Press down fully to take the shot and a full resolution 20 megapixel JPEG is committed to removable media card in just over two seconds - so respectably swift. Face detection/selection and tracking focus are also offered here as standard features. Keep a forefinger on the zoom lever that encircles the shutter release button and the HX400V powers through its 50x optical zoom range from wide angle to telephoto in around 4 seconds. 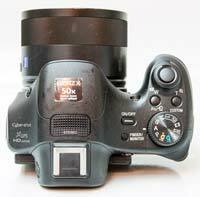 The alternative method is to use the manual zoom ring as already mentioned, though this is slower to respond than using the zoom lever. However the upshot is that it's slightly easier to arrive at more precise framing. Next to the power button is a raised, ridged-edged shooting mode button with an action that is stiff enough to prevent the user accidentally slipping from one setting to the next in the thick of it. There are 11 options on this dial. We get the creative quartet of program, shutter priority, aperture priority and manual mode settings plus Sony's now ubiquitous Sweep Panorama function, whereby the user pans through an arc as directed by the on-screen arrows - the resulting elongated shot automatically stitched together in camera. It's both very effective and very easy to use. Next to this setting we get two memory recall modes, marked 1 and 2, which, as the camera describes recalls registered settings and resumes shooting. Also on the dial is a dedicated High Definition video mode for up to 1920x1080 pixels clips at 50 frames per second progressive capture, which complements the dedicated video record button top right of the backplate. While a press of the latter begins a recording despite the fact that you might have a stills shooting mode selected on the dial at the time, a press of the Menu button when in video mode accesses a variety of options. Here we can not only adjust video resolution and vary the frame rate, but also switch from intelligent auto video recording to applying a specific scene mode, as we more usually can with stills photography. There's the ability to filter out external wind noise too, while another bonus is that full use of the optical zoom is provided in movie mode, as is automatic focus adjustment if you alter framing or swap subjects mid sequence. Scene modes are up next and there are 16 user selectable options on the Sony Cyber-shot DSC-HX400V, covering everything from the usual portraits - including a separate DSLR-style 'background defocus' option - to shooting landscapes by night and even handheld; pet, beach, snow and fireworks mode round out the more usual suspects. Incidentally the sensitivity range is broad and stretches from ISO 80 to ISO 12,800 with many incremental points in between. Our only moan is that we could have really done with a dedicated ISO button marked as such. There is a 'custom' button provided alongside the one for the 'Function' menu just behind the shutter release on the top plate, with a large choice of dedicating this to one of 21 different settings, including the ISO. The new Function button provides quicker access to up to 12 of the camera's key settings, depending on the current shooting mode. You can also customise this menu to suit your needs. With the shutter release button and the zoom lever that encircles it comfortably sloping forward at the top of the handgrip, that's it for the HX400V's top plate. The rear of the HX400V is dominated by the tilting 3-inch, 921k dot resolution LCD screen, which can be angled up or down, but not swung out through 180° so it sits alongside the body, like with a camcorder, or flips inward to face the body itself. This means that, whilst very useful in itself compared with a fixed monitor, it is best used for achieving those otherwise awkward low or high angle shots than anything more ambitious. The alternative as mentioned earlier is to use the EVF ranged directly above the LCD, complete with a dioptre control for glasses wearers, though as this is both smaller and has a lower resolution (202k dots), we found it easy to overlook. In terms of controls the back of the Sony Cyber-shot DSC-HX400V looks slightly sparse mainly due to the small dimensions of the actual buttons, though in fact most of the essentials are here. 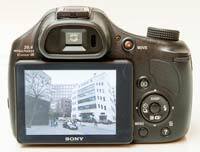 A dedicated movie button is located to the right of the viewfinder, while a DSLR-like jog dial sits alongside that, where it automatically falls under the thumb of the right hand as the camera is gripped. The familiar four-way control pad beneath the movie record and playback buttons features options for controlling the rear display, flash settings (with red eye reduction turned on or off via the menu screens), combined exposure compensation and photo creativity, and self-timer/burst shooting (either 10fps per second for up to 10 sequential shots or 2fps to the same number). Pressing the down button whilst in the Intelligent Auto modes brings up some on-screen 'photo creativity' options if the user is shooting in one of the auto modes. Selecting this option on the pad, for example, allows users to darken or lighten the image by flicking the jog dial left or right. Colour can also be adjusted in the same manner and the picture effect options previously detailed can be flicked through via a virtual mode dial. It reminds us a lot of the Live Guide feature on Olympus Pen cameras; namely it allows newcomers to exert some personal control over the outcome of their shots without knowing anything about exposure values, aperture settings and so on, with adjustments shown on screen live and in real time before the shutter release button has even been pressed. Underneath the four-way control pad are two buttons marked Menu and Delete/Help. A press of the former opens a number of shooting and setup folders, with white text on a black background aiding visibility. The seven shooting folders allow users to select image size, ratio and quality, plus features like SteadyShot, long exposure and high ISO noise reduction - all in fact activated as a default. The Settings folder allows you to tweak the HX400V to your way of working, while the other four folders contain the various Wi-fi, Applications, Playback, and Setup options. The Sony Cyber-shot DSC-HX400V is wi-fi capable and the functions can be adjusted in the dedicated Wireless main menu option. You can choose where to transmit the images to (either smartphone or computer) and view them on a compatible TV. You can use WPS Push to force locate a hot spot, access settings, edit the device name, display the MAC address or format all settings if you wish. Pressing the Function button when you're looking at the pictures you've taken allows you to quickly send images to your smartphone or tablet. One cool feature of the wi-fi is being able to link the camera to your smart phone using the PlayMemories Mobile "Smart Remote" app. You can then use the phone as a remote so those outstretched arm 'selfies' will be a thing of the past. The HX400V is also the latest Sony camera to feature NFC (Near Field Communication) technology (the same technology that's used for mobile payments), which allows you to connect it to a compatible internet enabled device or another NFC-enabled camera by simply tapping them together. The HX400V also offer built-in GPS, which tags all your photos and videos as you travel and lets you view them on a map. On either flank of the camera is a metal lug for attaching the provided shoulder strap, while on the left hand flank there is a flip-open door protecting the camera's two ports. Here we get an HDMI output and the Multi Terminal Interface port which allows the connection of a growing range of accessories. 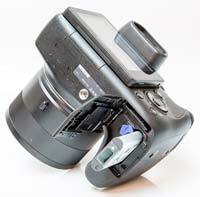 Battery life of the lithium ion cell inserted in the base of the handgrip is around 300 shots. On the bottom of the HX400V is a metal screw thread located and a compartment housing the battery and a slot for either Memory Stick PRO Duo or Secure Digital cards.